NEW YORK, Sept. 12, 2017 /PRNewswire/ — Luxury vodka brand Absolut Elyx has debuted the world’s most fashion forward car by transforming a 1949 Cadillac Fleetwood 75 into a custom copper cab. The bespoke concept is the ultimate in lux transportation and has been spotted throughout New York City around the clock for Fashion Week. The brand has curated a complete Elyx experience transporting A-list talent and industry elite to some of the most buzzed about shows while providing fanciful comfort and top-notch service. The copper cab kicked-off on Saturday, September 9th chauffeuring top influencers including Andrea Pion [@asliceopi], Natalie Suarez [@NatalieOffDuty], Dylana Suarez [@Dylanasuarez], Tessa Barton [@tezzamb], Erica Choi [@eggcanvas] and more. MILK Studios Editorial Director Mathias Rosenzweig conducted live interviews as they transported fashion notables to and from shows at Skylight Clarkson Sq. Celebrities have also been spotted riding in the customized copper cab to fashion shows including Alice + Olivia, Self Portrait, Jill Stuart, Alexander Wang, Phillip Plein and more. It is set to pop-up at Bono’s EDUN Collection Store Opening and will conclude on September 13th. The taxi interior features an Absolut Elyx signature pineapple damask wallpaper, copper disco ball, Polaroid camera, an eclectic mix of vintage pieces fusing classic New York glam with a modern-day concept and a fashionable chauffeur outfitted in a custom copper sequin blazer. Every drop of Elyx is distilled in a vintage copper still, which plays a unique role in the distillation process and inspired the copper lifestyle surrounding the brand. Paying homage to the iconic New York City taxis, the copper cab is a playful modern interpretation of the iconic checker cab service with hospitality at its core. Consumers seeking more copper are directed to the unique Elyx Boutique to purchase the brand’s playful copper pieces including their coveted pineapple gift set, barware, martini kits, copper cups and a variety of fashion and home décor items. 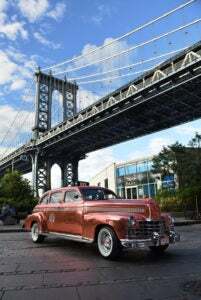 With past stunts from the luxury vodka brand including a copper helicopter, the 1949 Cadillac Fleetwood 75 Copper Cab is the first of its kind and has quickly stolen the spotlight on the streets of New York.